22. Apr 2019, 06:47 Hallo Gast. Thanks for the clarification Walk. However, I have to pose a few more questions (if you wouldn't mind giving me a few moments of your time?). Firstly, which do you think would have been the greater work of grace, and the better world, if Melkor had not interfered - The Lamps, whose holy light shone upon all the world in the beginning, and all the world was tranquil and holy, or the Trees, which were the greater, as you said, but enhanced only the bliss and light of Valinor itself. 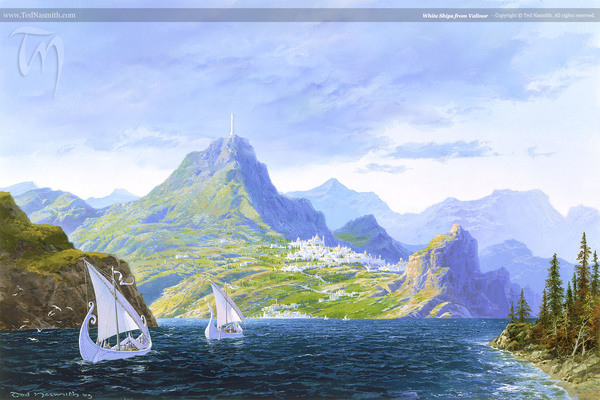 For if men had come into the world under the Lights of the Lamps, would they too have known the Bliss of Valinor, which to me would seem as the Bliss of Numenor in the eyes of men, when their days were long and they layed down their lives and accepted the Gift of Men, as they were always meant to? Secondly, I'm interested to hear your opinion and interpretation of Dagor Dagorath and its prophecy, which I've been reading up on recently and I find absolutely fascinating. "Thus spoke Mandos in prophecy, when the Valar sat in judgement in Valinor and the rumour of his word was whispered among all the Elves of the West. 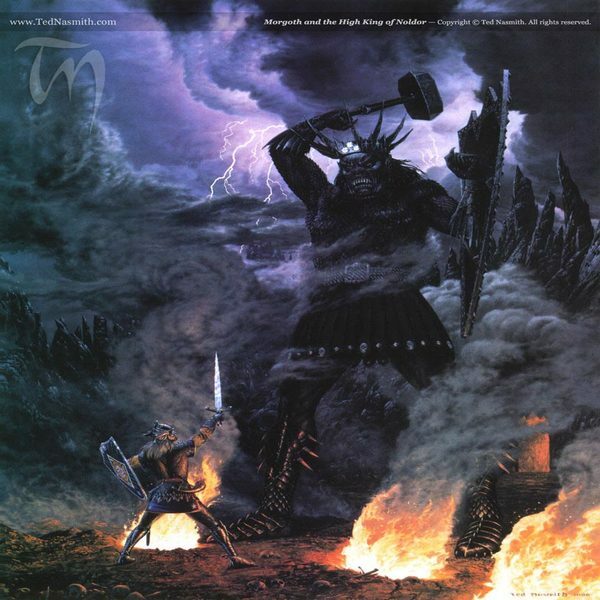 When the world is old and the Powers grow weary, then Morgoth, seeing that the guard sleepeth, shall come back through the Door of the Night out of the Timeless Void; and he shall blacken the Sun and the Moon. 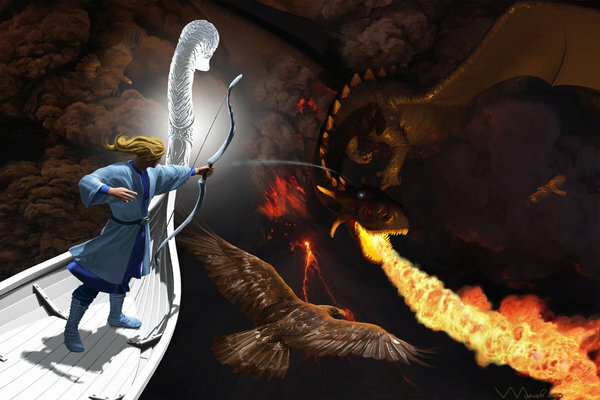 But Eärendil shall descend upon him as a white and searing flame and drive him from the airs. Then shall the Last Battle be gathered on the fields of Valinor. In that day, Tulkas shall strive with Morgoth, and on his right hand shall be Eönwë, and on his left Túrin Turambar, son of Húrin, returning from the Doom of Men at the ending of the world; and the black sword of Túrin shall deal unto Morgoth his death and final end; and so shall the Children of Húrin and all fallen Men be avenged. Thereafter shall Earth be broken and remade, and the Silmarils shall be recovered out of Air and Earth and Sea; for Eärendil shall descend and surrender that flame which he hath had in keeping. Then Fëanor will break them and with their fire Yavanna will rekindle the Two Trees, and a great light shall come forth. And the mountains of Valinor shall be levelled, so that the light shall go out over all the world. In that light the Valar will grow young again, and the Elves awake and all their dead arise, and the purpose of Ilúvatar be fulfilled concerning them. But of Men in that day the prophecy of Mandos doth not speak, and no Man it names, save Túrin only, and to him a place is given among the sons of the Valar.” - The Later Quenta Silmarillion, Christopher Tolkien; History of Middle Earth, 11th Volume. This first part is pretty straightforward - the Valar, even in the undying lands, shall grown weary of the world, and the guard on the Gates of Night will weaken till Morgoth arises once more to wage final war upon the world. Earendil shall drive him down to the fields of Valinor (he just keeps adding to his list of awesome deeds, doesn't he?). However, what I'm interested in this paragraph is the last part about Túrin, one of my favorite non-elven characters (I seem to have a running theme of liking really flawed characters, huh? First Feanor and now Turin ). So it says that by the hand of Turin Morgoth shall fall and that 'all fallen men shall be avenged', which seems to imply to me a redemption of sorts for the 'evil men' who were deceived by the darkness, such as the Easterlings and Haradrim. And how the hell does he get the power to slay Morgoth? The gift of men is to allow men to grow to greater things then the world allows and pass beyond it, so perhaps when he returns from this ascended, higher plane of existence (kudos if you get the reference), any man would have the power. Jumping briefly ahead to the of the second paragraph of the Prophecy. 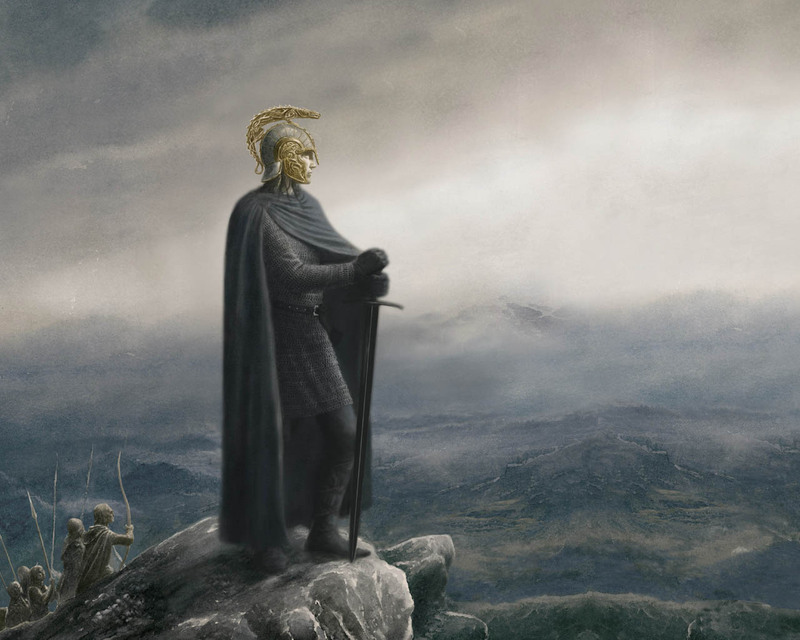 "Save Turin only, and to him a place is given among the sons of the Valar"; could this mean that as Huor, he will be allowed the life of the Eldar? Or does 'sons of the Valar' mean something else, such as a Maia? And what of the fate of the rest of mankind, particularly those living in the Hither Lands during the final battle? I can't tell if the second song is supposed to come after the entirety of the prophecy has passed, or whether the second song is what the paragraph refers to when it is said "Thereafter shall Earth be broken and remade". If the entirety of the world was remade, would they really need Feanor and Yavanna? Couldn't they just write the trees into the basic 'code' of the new universe, the remade world? Or perhaps the second song where the world is remade is not to completely 'restart' the universe, but rather 'fix' it from the marring, repairing and replacing corrupted and destroyed parts with completely new creation but leaving the good parts (such as Valinor) relatively untouched. The rest of the second paragraph is relatively straightforward: Feanor will break the Silmarils and with their light the Trees shall be reborn. I have to wonder whether Feanor could then remake the Silmarils, for though in the Silmarillion he claimed he could never again make their like, Yavanna also claimed such about the trees, and the prophecy says that they shall bloom again. The Pelori shall be leveled so all the remade world may bask in the light of the Trees, and the Glory of the Eldar Days shall yet again come. One other part that confuses me "the elves awake and their dead arise". The elves are supposed to be immortal and reincarnated in Valinor even if they are slain, so this passage confuses me. Perhaps it simply means all those left in Mandos shall be revived into bodies? Or mayhap, as even the powers weary of the world, the Elves in the eternal realm begin to fade. And though it is not mentioned in the prophecy, Az-Pharazon and his host, will they fight much as the army of the dead did? If so, there is absolutely no way the free peoples and the Folk of the Light should lose. I will just try to enrich this topic with a bit better resolution of that picture, discussion and some wise comments will leave for another time. Need to refresh my memory so I could discuss properly. Also I am enjoying in reading this blog and I am very glad to see descriptive and precise comments in lore terms. They are enriching knowledge of readers as quality of this topic/blog. First of all, thank you, Crag, for the kind words. I always try to make this lore section the liveliest possible, and other people too (you and Vector included, obviously) contribute meaningfully to the whole outcome. Regarding Vector's arguments, it's absolutely true that Men could have lived a truly free and happy life if the Two Lamps – which determined the original symmetry and perfection of Arda – had not been destroyed by Melkor's schemes. A really fearless and doubt-free life, according to the true nature of the Gift of Men granted by Ilúvatar to Human beings. The doubt I referred to is the archetypal doubt of Men involving death, the ultimate destiny and the reason of all the pains and sorrows that they have to face by nature due to their lesser physical and spiritual essence; a doubt ingeniously spreaded by Melkor and used by Sauron as well in later times, especially when he took control (metaphorically) of most of the Númenóreans' minds by having taken advantage of their resentment for their mortal condition, and when he finally conveyed all these ill feelings towards the innocent Valar. The eternal conflict between the Good and the Evil, along with the incredible events that took place, is really what gives Arda its pure spirit. 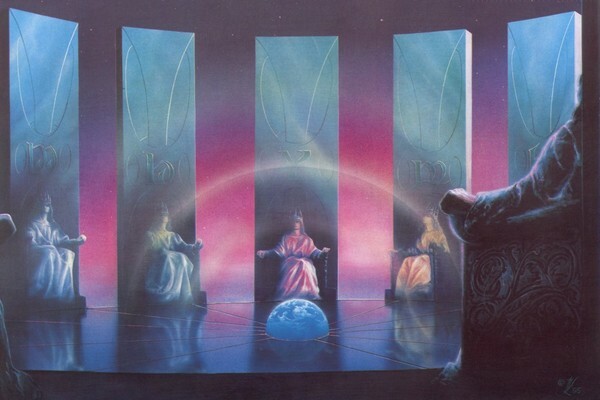 I totally like more the idea of a far, mysterious and isolated Blessed Realm permanently protected from any evil being rather than a totally (most of it) holy World with the Valar's kingdom at its centre (the ancestral and edenic Almaren). Moreover, if you look at the quotation I posted at the beginning of the thread (my favourite), Tolkien explicitly tells us that what stands beyond the Pelóri surpassed in splendour and beauty the Spring of Arda (though everything is kind of compensated by the fact that Valinor is exclusive and isolated). A sort of contrast between pervasive/shared holiness (though minor) and concentrated/exclusive holiness (though greater). 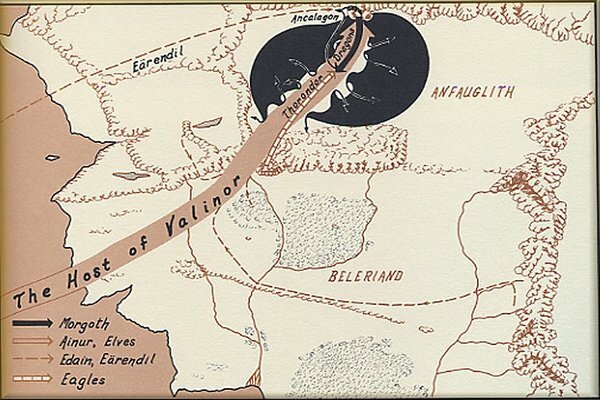 The prophecy you dealt with is the one I too have knowledge about; but, I think this tale is something collected from other minor stories as you won't find anything more in the Silmarillion than really tiny references, also because the text says that only Manwë and Varda may probably know the true Plan of Ilúvatar and how things will approximately be. 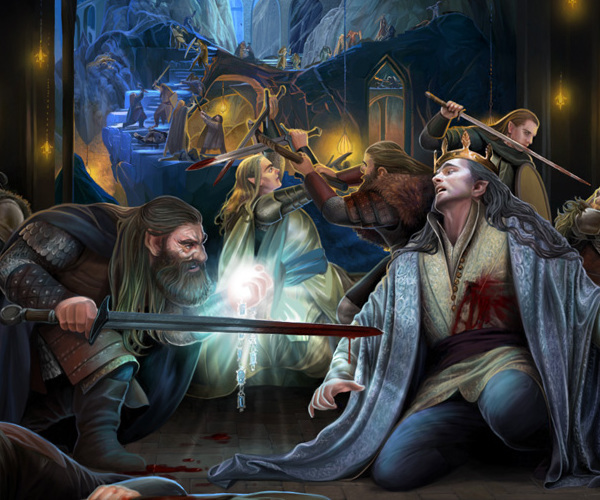 I personally think that the 'dead arising' among the Elves could be the mourning spirits of the Elves in the Halls of Mandos that will eventually find redemption only at the End of Time, as Fëanor shall eventually renounce his Silmarils for the sake of Arda. Furthermore, to address everyone interesting into this blog, sorry if I didn't manage to post the update I had planned long ago, but I don't really have time this period to add this task (which is absolutely not a daunting obligation that I do unwillingly) to the common moderating work I currently do and my academic mandatory obligations. The War of Wrath is the terrible, destructive and ultimate War (lasted approximately from the year 545 to the year 587 of the First Age) between the forces of the Good and the Evil in the Westernmost Lands of Middle Earth at that time. This was the last direct confrontation between the Powers of Valinor and Morgoth, which also closed the cycle of the violent and mournful Battles of Beleriand between the Noldor of Beleriand and the Enemy of the World in the War of the Jewels, abruptly ending the First Age itself. The Piety and Forgiveness of the Valar caused the definitive Defeat of the first and mightiest Dark Lord, and the total dispersion of the Evil powers in the World for many centuries. The previous events, that led to this violent end, will be forever remembered by the People of Arda as the War of the Jewels, the Silmarillion. Legendary yet sorrowful deeds, the authors of which are still mentioned in all the legends of the World, for the Good and for the Evil. Fëanor convinced his brother Fingolfin and all the Princes of the Noldorin Royal Family and its People to follow him in Middle Earth, reaching Beleriand via the stolen White Ships of the Teleri or by passing through the extremely perilous Helcaraxë. His pivotal goal was primarily taking back what Morgoth had shamelessly dared to steal, the three legendary Silmarils, which kept alive the ancient and Holy Light of the Two Trees of Valinor, previously poisoned and destroyed by Melkor and Ungoliant. 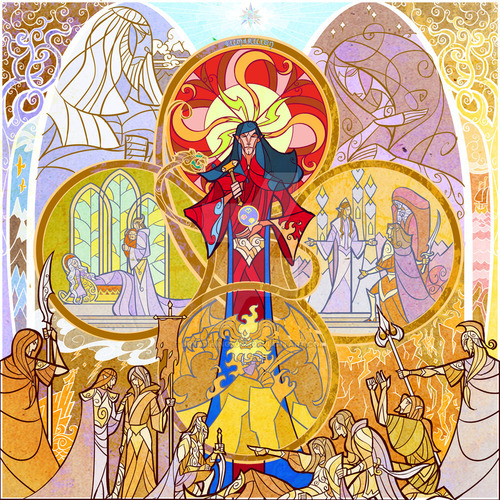 Fëanor, along with many of the Noldor, also hoped to create other mighty realms in the free Middle Earth and somehow recreating the Splendour and Glory of Valinor outside the Pelóri, afar from the authority and 'surveillance' of the Valar (whom he believed to have 'contained' the Power and Ambitions of the Noldor in their Blessed Realm). But the sad yet impetuous High King of the Noldor completely failed his purposes (having also his Mind poisoned by the lies of Melkor), and, as the Valar had predicted, found a rapid and tragic death on the dark and cold Lands of the North of Beleriand; forever bound to restlessly mourn in the Halls of Mandos. In more than long and suffered 500 years of War, the Noldorin Royal Family had been completely exterminated, apart from Galadriel and the last two sons of Fëanor, Maedhros and Maglor. 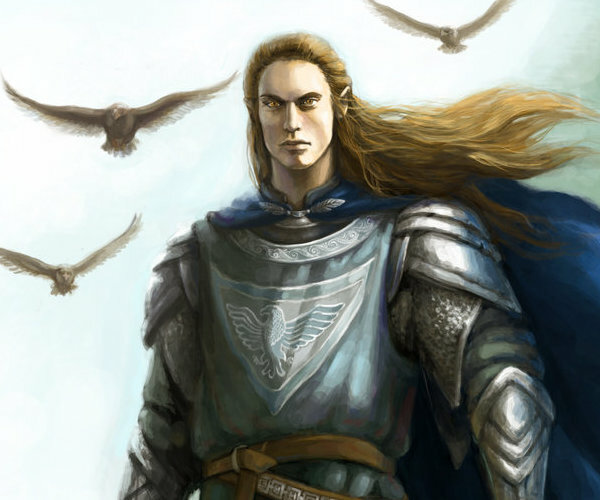 All the legendary Noldorin Realms of Beleriand were completely and violently destroyed one by one during the War, the Millennial Kingdom of Doriath (protected by the Magic of Melian the Maia) was laid waste and plundered many times, and the heroic deeds of many incredible characters of this War were sadly not enough to overcome the Enemy. But Morgoth was also 'indirectly' helped by the very Arrogance and Greed of the Sons of Fëanor, who committed impious and terrible atrocities on behalf of their Oath, even against their own Kin, as the infamous Kinslayings. 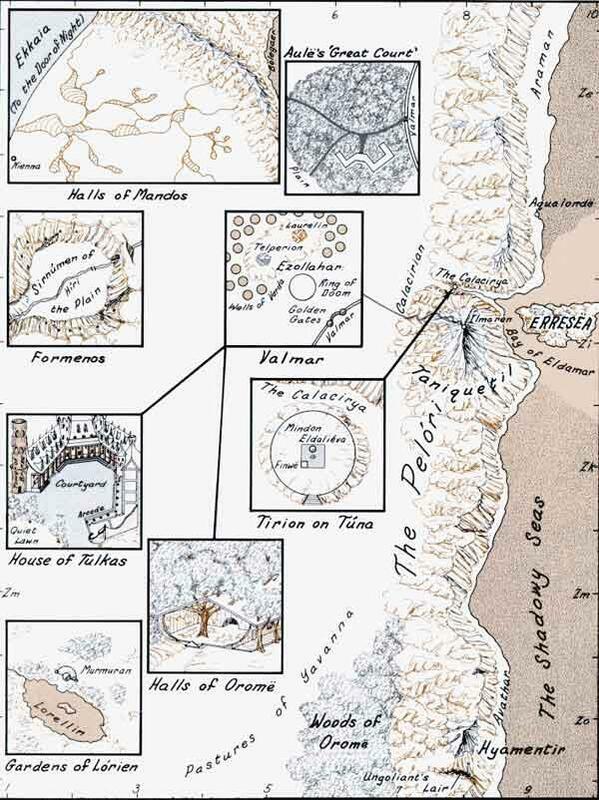 The survived Eldar (Noldor and Sindar) found a momentary refuge on the Western Coast of Beleriand, both threatened by the Enemy in the North and forsaken by the West, as their initial choice of the Exile consequently implied. 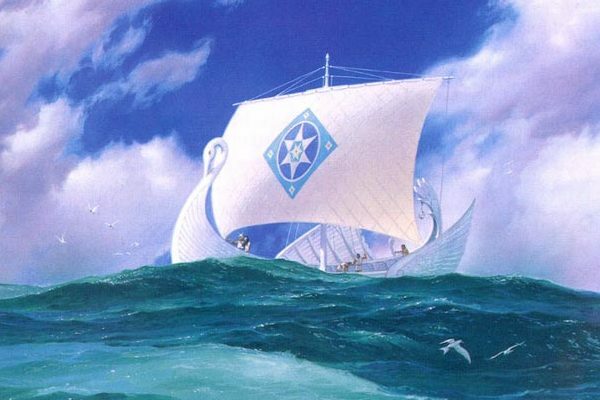 Then, in that hour of deep Darkness and Danger, Eärendil, the Mariner, with his wife and a Silmaril (the one rescued by Beren and Lúthien), passed through the Belegaer and the Enchanted Isles with his legendary Ship Vingilot, and finally reached the Immortal Shores. 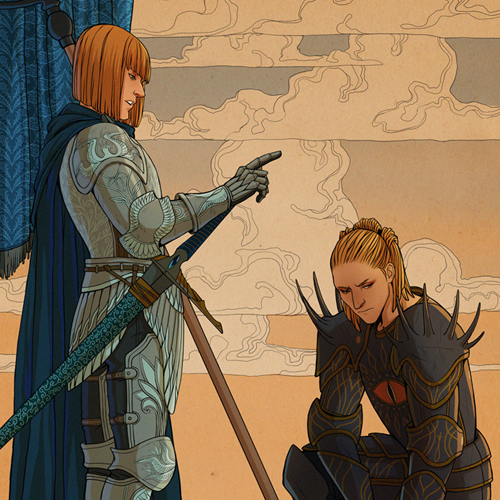 There, Eärendil asked for forgiveness in front of the Valar, for the sake both of Elves and Men, being him a Half Elf. At that time, Morgoth controlled almost all Beleriand, and his Power was unmatchable by anyone, mortal or immortal, who lived in Middle Earth. From the terrible Depths of Angband, and from the Mighty and Terrible Three Volcanic Mountains of Thangorodrim, he could have never known Defeat by any of the remaining Eldar or Edain. The Valar listened carefully and pitifully to the desperate and sincere plea of Eärendil, and eventually forgave him, his wife Elwing, and all the Eldar and Edain who had been mourning unspeakable sorrows in the Lands of the Exile, Beleriand, against the Ultimate Evil. The Archangels of the West enchanted the Ship of Eärendil, Vingilótë (or Vingilot), and made it the legendary flying Ship that all the legends know, and Eärendil became the Legendary Mariner of the Skies, with his Silmaril on his forehead, being him the brightest Star of the Sky, and a symbol of Hope for all the ones, among Elves and Men, who face and experience the snares and horrors of the Evil in all its forms. 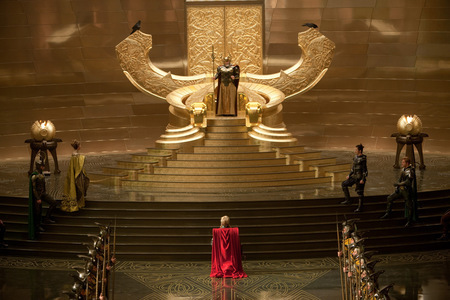 The Valar, then, sat again in Council, on their thrones in Máhanaxar, at the doors of the Supreme City of Valimar. The Kings and Queens of Aman took the final decision to destroy Morgoth once and for all, removing forever from the World the cause of all the previous and future Wounds of Arda. 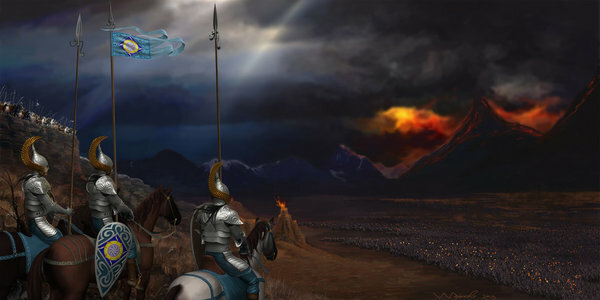 Then, the Powers of Aman, although sadly aware of the consequent and ineluctable destructions, prepared a mighty Army in Valinor, formed mainly by the Maiar and the Vanyar of the Blessed Realm; but, also the Noldor of Eldamar, led by the King of Tirion Finarfin, were part of this sensational force. 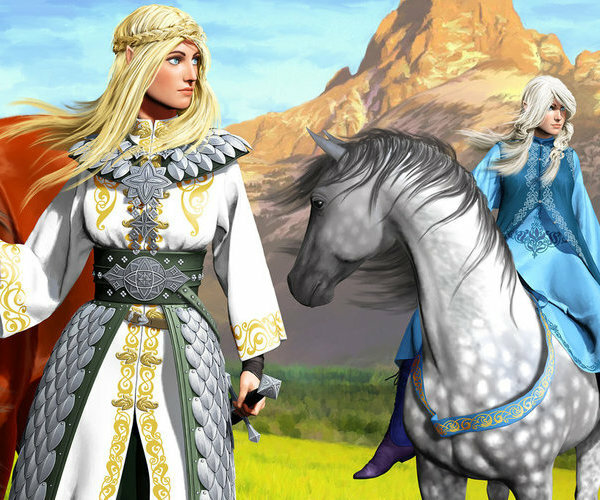 Even the Teleri of Alqualondë and Eressëa decided to aid and contribute to this legendary Quest, moved by all the sufferings of their kin of Beleriand (Sindar). 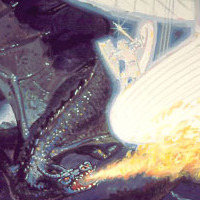 They, though, only chose to carry the Army of the Valar with their White Ships across the Sea, avoiding thus to directly participate in the War, or even put their feet on Beleriand, for their Memory of the Kinslaying of Alqualondë was still present, and they were also shocked by the other atrocities committed by the Sons of Fëanor. This Legendary Host, then, passed across the Sea, to fight the last major War of the Elder Days, and the most violent one from the Ancient Days of the Two Trees and the War for Sake of the Elves. It was the last conflict in which the Archangels of Aman showed directly their immense powers to the World (although they were not directly present in this War). 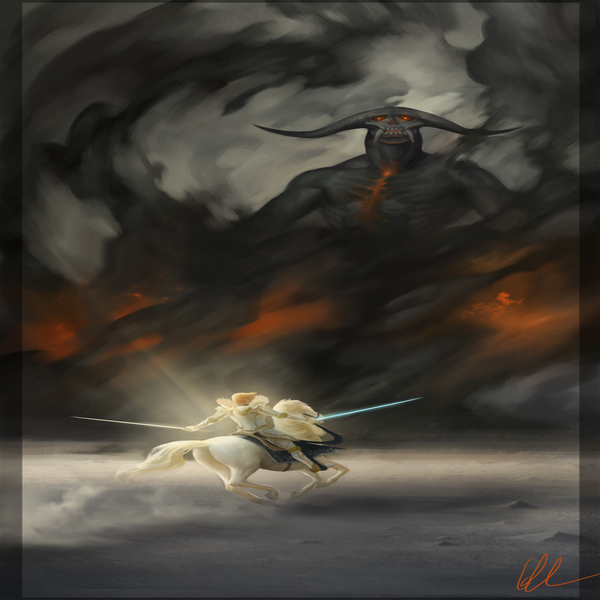 The Army of the West was led by Eönwë, the supreme Herald of Manwë, and the Chief of all the Maiar of Valinor. He represented the absolute Authority of Manwë on Arda, and was ordered to destroy all the forces of Morgoth in Beleriand and take back the remaining two Silmarils which still were set in the Iron Crown of the Enemy of the World. But the Herald of the King of Arda was not alone, for many other Maiar followed him, and, among the Eldar, Ingwë, High King of the Vanyar and all Elves, and Finarfin, High King of the Noldor of Aman, followed him as well. Among the Eldar of Beleriand, there were powerful Elven Lords and Warriors, who would have had a greater role in the future events of Arda, as mighty Commanders or Guardians; the most famous ones were the High King of the Noldor of Beleriand Gil-galad, his Herald Elrond (son of Eärendil and Elwing), Elrond's twin brother Elros (the future first King of Númenor) and Círdan the Shipwright, great Lord of the Sindar of the Coast. 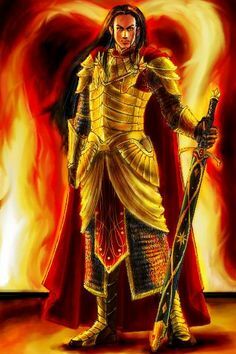 Morgoth, although always very suspicious and fearful of the Powers of Aman, would have never expected such a violent, disruptive and yet immediate attack from the West. In his malicious Mind he truly believed to have forever divided the Eldar of Beleriand from the Love of the Valar, and reduced his Enemies in Middle Earth into harmless future Slaves. His dominion over Beleriand was, though, almost complete (apart from the remaining Western Shores); and his horrible ranks were bigger and wider than ever, counting on a wide range of deadly creatures. The Host of the Valar finally landed on Beleriand, and quickly prepared to assault the heart of the Power of Morgoth, his terrible fortress Angband; the forces of the West were joined by the remaining of the Noldor (mainly the House of Fingolfin), of the Sindar and Nandor, and of the three Houses of the Edain, along with the Ancient Dwarves of the Blue Mountains (when they used to be far mightier and extended Mountains). It is likely, on the other hand, that the Noldor of the House of Fëanor didn't join the War, being them still resentful towards the Valar, and still desperately seeking for a way to get back the objects of their infamous Oath, the two Silmarils possessed by the Dark Lord. 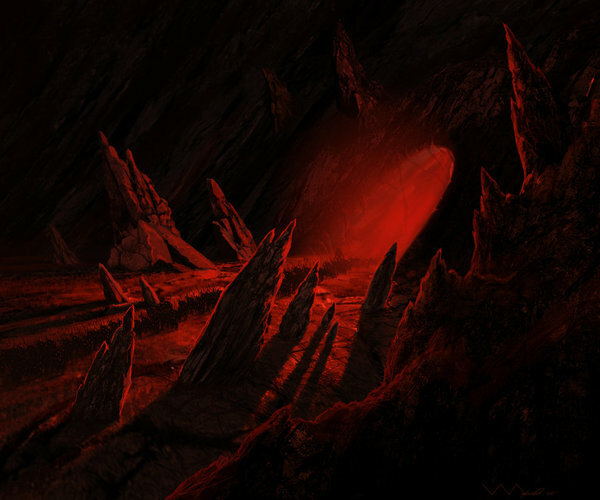 Angband was excavated in the depths of the Iron Mountains, in the Extreme North, in ancient and forgotten Years, even before the Awakening of the Elves, and it had survived a previous assault of the Valar during the War for the Sake of the Elves, although the fortress had been stormed and damaged by the forces of Valinor anyway. Furthermore, the three titanic Towers (Volcanic Mountains) of Thangorodrim protected the entrance of Angband, and they had been an inviolable defence until that time, resisting the long and suffered 400-year Siege of the Noldorin Princes. Morgoth, then, now conscious of the imminent threat, decided to remain safely in his inexpugnable domain and to confront his Enemies at its doors. The Host of the Valar eventually managed to reach the sad shores of Beleriand, that had begun known at that time as the lands of sufferings for many Eldar. The Host proceeded promptly against the Enemy in the North, firm and justly cruel in its resolution of cleansing Arda from the Evil that had darkened it for so much time. 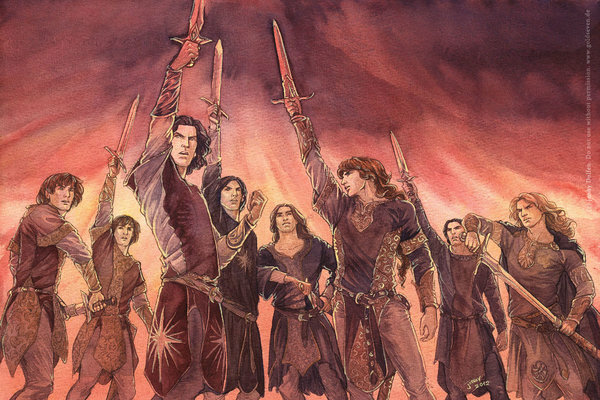 The whole Beleriand was in an utter turmoil as the ranks of Valinor were ordered in new and terrible forms, and their trumpets and horns made everything around them resound and tremble. Now, the banners and standards of Eönwë could fill that sorrowful land with Hope, that Elves and Men had been awaiting for centuries. The loyal joined forces of the Elves and Edain of Beleriand followed the Herald of Manwë too, and they prepared for the final assault. 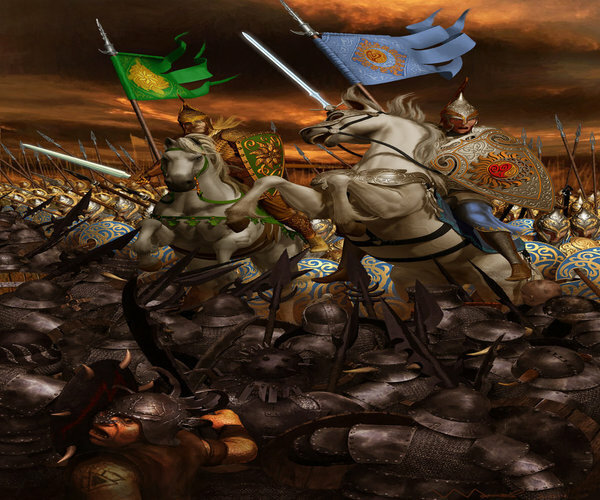 Very little is known in details about all the preceding phases of the last battle, especially how the forces of the Light got through the lands of Beleriand and finally came at the Enemy's iron gate. This is due to the fact that the majority of the Eldar involved in this conflict had come from the Immortal Lands and in the Immortal Lands returned after the War of Wrath, without many possibilities of sharing specific memories of those years with other ones of their kin. Nevertheless, the ranks of the Good consisted also of many Eldar that later decided to linger in Middle Earth, moved by their immense love for the mortal World; one of them was Elrond the Half-Elven, and his twin brother Elros was with him too. Even the new High King of the Noldor Gil Galad fought beside them, and the memories of that legendary war remained forever crystallised in their own mind, as eternal remnants of the Elder Days. On the other hand, Galadriel, one of the last survivor of the Noldorin Royal Family, and his husband Celeborn, a Prince from Doriath, opted for fleeing from that violent and terrible clash and seeking for shelter beyond the Blue Mountains, leading many Elven refugees from other fallen realms. Albeit not being so clear, as obscure traces of a sad past, the common tales tell that the Host of the Valar headed North, without any kind of difficulty, and reached the plain of Anfauglith, in front of the gates of Angband, where Morgoth had exactly disposed his forces for the last apocalyptic battle of the First Age. The Anfauglith was previously known as Ard-galen, an enormous plain in the North of Beleriand; a luxuriant ensemble of green fields that would even reach the slopes of the Iron Mountains and the doorsteps of the Iron Fortress. After the return of the Evil and the beginning of the dreadful clashes between Light and Darkness for the sacred Jewels, the plain was ultimately laid waste and turned into a horrible and silent desert of ashes, drought, death and despair. It was thus here, at the turn of the tide, that the Dark Lord eventually decided to bring forth all his power, for he could have never permitted the forces of the Good to triumph over his own dominion; and his whole dominion was, he believed, Middle Earth itself. The Dark Throne of Morgoth was thus entirely thrown on the battlefield, unleashing what had being prepared in the dungeons of Angband for centuries, waiting for this exact moment: the decisive fight for the control of all the free lands in the Eastern Continent. Tribes of Evil Men from the remote East of the World, descendants of the people of Bór and Ulfang, answered the call of their Master and gathered at the Dead Plain. 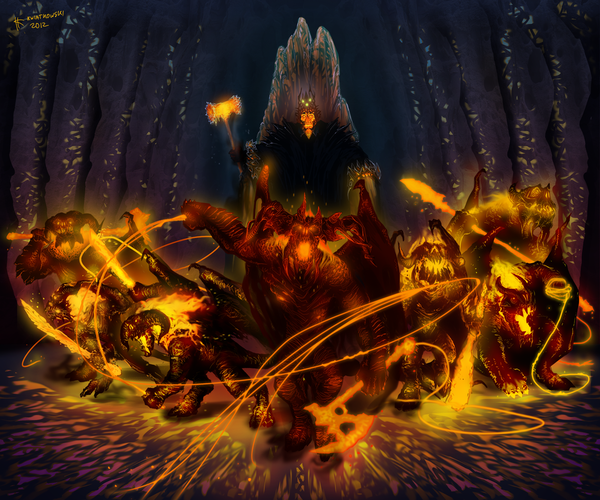 Although most of those Easterlings decided voluntarily to serve the Darkness, it is also undoubtedly true that their ancestors of the far East had already been caught in Morgoth's web of deceitful lies since their very awakening; that is, disguised as a mysterious pilgrim, the Dark Lord attended their tribes and managed to have them be resentful towards the Valar and Ilúvatar itself, twisting the real meaning of Human Death (the Gift of Ilúvatar). Then, he convinced them to journey to Beleriand via false promises of green lands to live in, while, in the end, the very beauty of Beleriand was for them denied and they were all turned in nothing more than mere slaves. 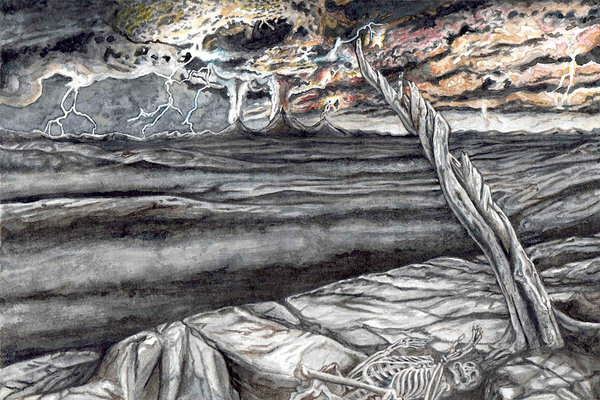 The core of Morgoth's might consisted, however, of legions and legions of cruel and dreadful Orcs, bred for millennia by the obscure arts of Sauron in the deepest caves of Angband; the most manifest symbol of the initial splendour of the Eldar that was corrupted and ruined, as a plain sacrilege to Ilúvatar's Plan. 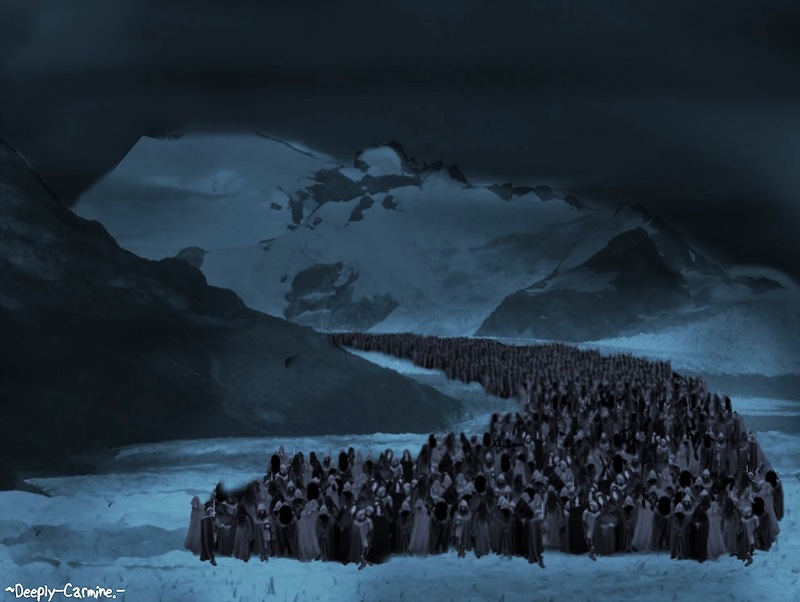 Hundreds of thousands of merciless minions that had come out from the deepest halls of the Iron Fortress or that had been summoned from the other occupied and wasted territories of Beleriand. The Dark Lord was immensely feared as he also relied on his widespread control over any sort of deadly creatures, that firstly appeared in the World in dark and unknown times. Among his dark ranks, he in fact could count on trolls, wild and untamed beasts, Werewolves, Vampires and the greatest threat of all: the Urulóki. These were infamously and sadly known as the fire-breathing Serpents of the North, whose rapid propagation caused devastation and unspeakable sorrows for Elves, Edain and Dwarves equally. At the top of that evil pyramid, there were the Maiar who had sworn allegiance to Melkor in the years before Arda itself. Almost all of them were the terrible Balrogs, great demons of Fire and Darkness that would lead the armies of their Master as cruel generals. Another Maia served Morgoth; the one, as tales tell, that had previously been a great scholar of Aulë and later known as Gorthaur by the Sindar of Beleriand, Lord of Werewolves and Vampires and master of the foulest kinds of Magic. Morgoth's deadliest servant: Sauron. Conscious of such power, the Dark Lord of Arda was preparing to cover the World in a new and perennial Darkness, that would have probably lasted until the End. All the Evil gathered under the threatening peaks of Thangorodrim, known as the Mountains of Tyranny. The incredible vastness of Anfauglith almost couldn't contain that ensemble of forces. It was there, at last, that the ultimate clash between Good and Evil of the First Age took eventually place. The clash that ultimately determined the fate of Arda was maximally violent, and it emanated a terrifying power from both sides, for the might of Valinor is as terrible as the Dark Lord's anytime it is openly displayed on the battlefield. The energy originated, spreaded through land and water, shattered Arda from its deepest foundations and irreparably marred Beleriand. There are not many precise chronicles of those lost and legendary times that could serve us so well in our inquiry into the past, but the Eldar that fought that war remember clearly that the whole Beleriand was in complete devastation: mountains were levelled down, rivers were brutally displaced or totally erased, shores sank into Belegaer and other new rivers and internal seas were created along all Middle Earth. 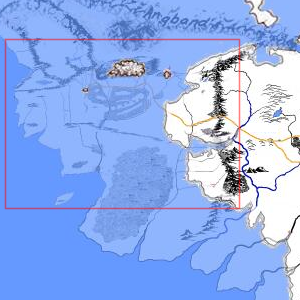 The very Beleriand was bound to face, from then on, the saddest destiny. Enormous clouds of darkness and ashes covered the entirety of Anfauglith, now almost filled with Morgoth's hosts; but in that moment, the forces of the West eventually reached the battlefield, and everything surrounding them was suddenly enlightened and shone of the very Light and Glory of the Blessed Realm itself, that the valiant champions of Valinor had captured in their own armours. Then, the Army of Aman and its numerous allies headed immediately to the gates of Angband, making their way through the innumerable legions of Orcs and terror crawled out from the fortress, as abruptly as a lightning pierces the still darkness of the night sky. Orcs, Dragons and the other foul creatures were completely caught and mercilessly exterminated, as wheat is rapidly consumed in a great fire. Then, it was the time of the cruel Spirits of Fire that served the Enemy and had commanded his vast ranks all over Beleriand until that moment. The Balrogs fought terribly and so fiercely for the destruction of the Host of Valinor, so that they brought death and much agony even among the fairest and mightiest Vanyar, seeming to bear the fatigue of battle as unmatchable opponents. Eventually, under the trumpets and guidance of Eönwë and the other holy Angels come from the immortal shores, the Eldar succeeded in that deadly challenge and vanquished the majority of those horrible generals. The very few of the Balrogs that managed to escape and seek for refuge hid themselves in the inaccessible deepest and darkest places of Arda, waiting for the time to be awakened again and doom the fate of other ones in times to come. Victory was near, but the power that had dwelt in Angband for millennia could have never been undone so easily. Fearing in fact the definitive defeat, Morgoth was thus ready to unleash his ultimate weapon. Something that he had worked on and poured many energies of his into for so much time; the result of unknown magical processes of corrupting and disfiguring the original nature of lost ancestral creatures. Something that nor the Maiar or the Eldar of Aman and Middle Earth expected. Something that risked to erase forever any hope to eradicate the Evil from those lands once and for all. In his most difficult moment during that apocalyptic contest, the final chapter of that legendary war, Morgoth unleashed the great Winged Dragons from the obscure dungeons of Angband. 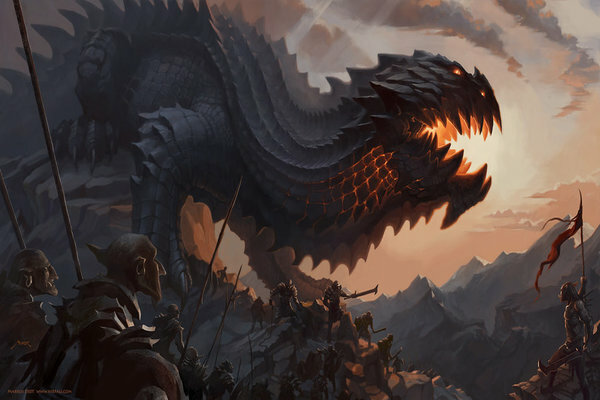 The feared Urulóki, the fire-breathing Serpents, could have not been compared to those new Dragons' magnitude: immensely vast, fast and so at ease they were in the air, yet immediate and terrible death they caused to the Good's side. No way was the Host of Valinor capable of warding off that incumbent and deadly threat, for the Dark Lord also sent forth great storms and the sky was all filled with thunder, lightning and fire at these creatures' arrival. Morgoth didn't dare to head out and confront directly his fierce enemies; locked and protected within Angband's mighty walls and Thangorodrim's impregnable peaks, he longed to finally disband the Army of the West with his new and deadliest creations. So, once all the Winged Dragons came out from their lair, it was then the time of the titanic and legendary Ancalagon the Black to play his part in that mythical clash. 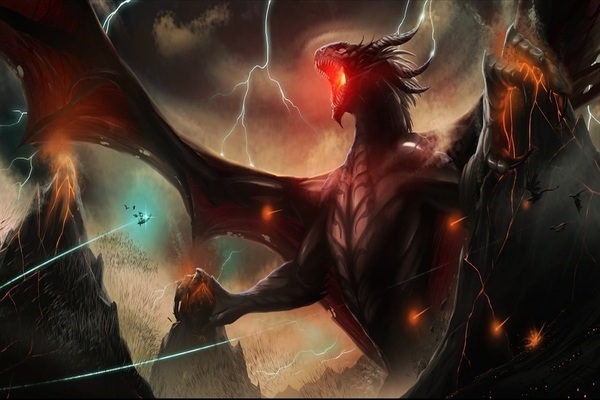 Ancalagon the Black was the Lord of the Winged Dragons and the mightiest of all the Dragons that had ever appeared in Arda; he was Morgoth's true most destructive weapon, surpassing every abomination that had been previously originated from his malice. Ancalagon was immensely vast even for a common Winged Dragon's standards. His wings covered clouds and seemed at times to darken the whole sky as well; his enormous shadow and roar disarrayed and almost upset the brave hearts of the Light. But, it was not until the Black King of the Dragons made usage of his mortal fire that the whole expedition of the Host of Valinor was in serious peril; so much darkness was poured in him that no one was capable anymore of even containing the unstoppable danger. The Maiar, the Vanyar and the Noldor of Aman had never faced such a relentless evil since the days of Ungoliant and the consequent darkening of the Blessed Realm. Hope was fading, and with it the whole fate of Middle Earth risked to be left forever to Morgoth's obscure and tyrannical will. When all faith seemed to be lost forever, the sky suddenly burst into a sudden explosion of intense and pure Light; an otherworldly and holy manifestation that Beleriand had not beheld for long time. Who lay beneath this glorious epiphany was comforted and relieved from the utter desperation borne until that moment. 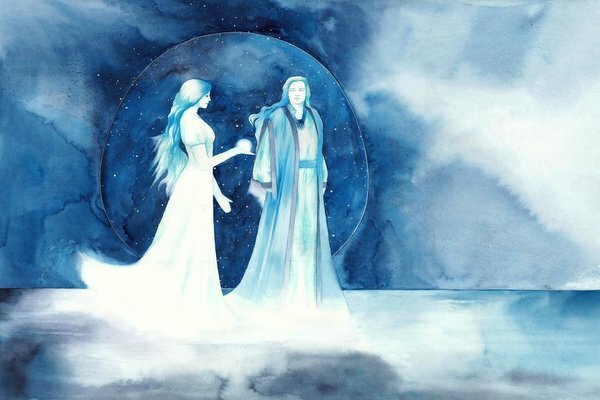 The mythical Light of the Silmarils shone again all over the vastness of Anfauglith and all the forces of the Good felt that Hope was still alive in their aching hearts: Eärendil had come from the brightest depths of the outer skies, upon his enchanted ship Vingilótë, with his Silmaril on his forehead. The Mariner was not alone though, because Manwë had also sent his own Eagles and other birds of different kinds, led by Thorondor, the King of all Eagles and all volatile beings of the World. The Vessel of Hope pierced the darkness of the sky and, along with the loyal creatures of the Lord of the Air, prepared to contest the terror of the Winged Dragons of Morgoth, in the last decisive clash. The two dreadful fleets fought each other for an entire day and an entire night, full of doubts and fear. 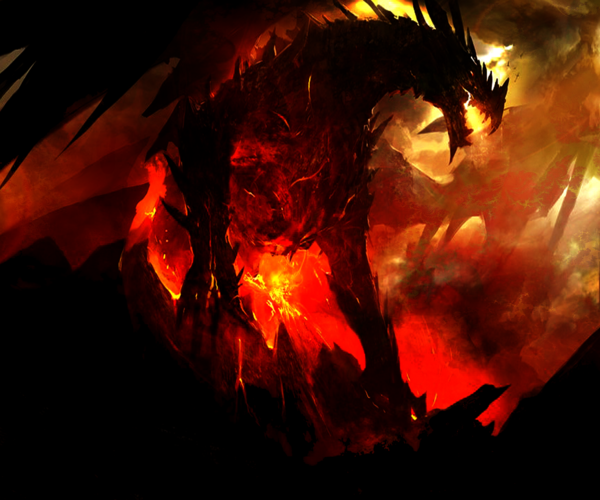 Ancalagon had immediately targeted Vingilótë, trying many times to destroy the last Hope of Middle Earth with his unstoppable fire. However, the Light that was before the Sun and the Moon, captured in the Silmarils, could have never been undone by any force existing in Arda. The ancient splendour of the Two Trees of Valinor, of which the Mariner kept one of the last three remnants, was proven to be an inviolable shield against any device of the Evil, and every effort of those deadly beasts was thus made totally ineffective. Then, Eärendil eventually slew Ancalagon the Black, whose immense ruin fell onto Thangorodrim and threw them down, erasing, after more than 500 years, what had been a prominent symbol of the Dark Vala's tyranny upon Beleriand and Middle Earth itself. 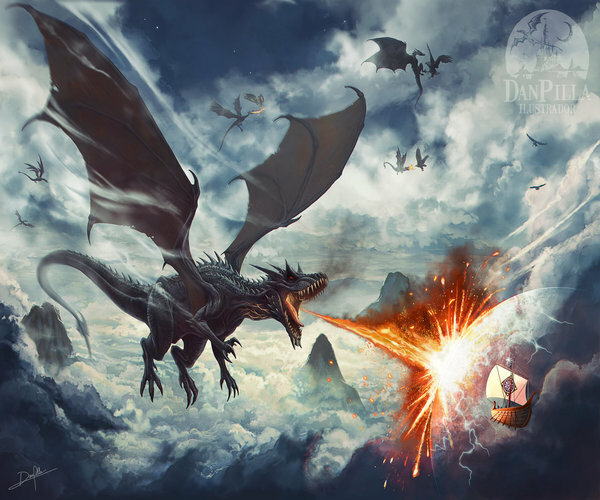 After that horrible monster's death, the Host of Valinor regained confidence and recovered rapidly from the previous happenings, and, with the help of the Eagles, took down the other Winged Dragons. The few that managed to escape the massacre flew away in remote and unknown places of the World, and they remained silent for centuries after. With every opponent vanquished or fled, the Army of the West finally headed to Angband, aimed to end the Dark Lord's dominion on Arda once and for all and bring him to the Archangels' judgement. 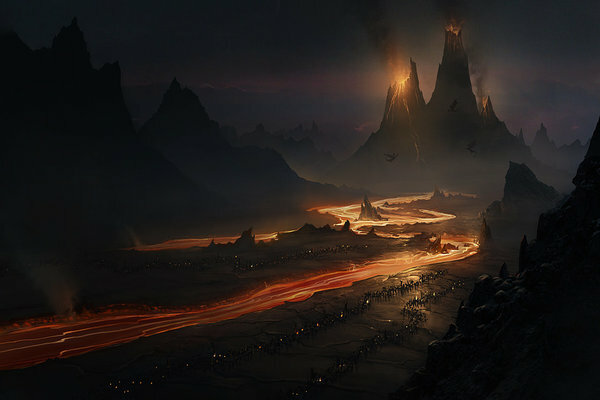 The gates of Angband were uprooted in front of Eönwë's majesty and the might of the Valar, via the King of Arda's Herald, descended violently into the darkest foundations and depths of the Dark Fortress, devastating its halls, caverns and prisons; many of the Eldar, the Edain and the Dwarves that were held captive there found freedom again. In that moment, sensing the inevitable defeat, Morgoth hid himself in the deepest dungeons of Angband and sought for mercy at the sight of the Chief of the Maiar of Aman. But there was not any trace of mercy in Eönwë anymore, for his deeds were Manwë's will itself and the Valar wanted the once mightiest of their kin completely obliterated and deprived of all of his powers. Therefore, the absolute judgement of the Powers of Arda was mercilessly enforced: Morgoth had his legs cut off from his body, he was chained again with the indestructible Angainor and his infamous Iron Crown became his collar. The two remaining Silmarils were then rescued and taken by Eönwë in his own custody, on behalf of the King of Arda. The Valar ultimately opted for the total removal of Morgoth from the edges of the very physical dimension itself, into the timeless Void. Melkor, the Enemy of the World, was then thrown beyond the Walls of Night, and this door to the outer empty darkness will forever be guarded by Eärendil himself, wielding his holy Silmaril upon his enchanted vessel Vingilótë. 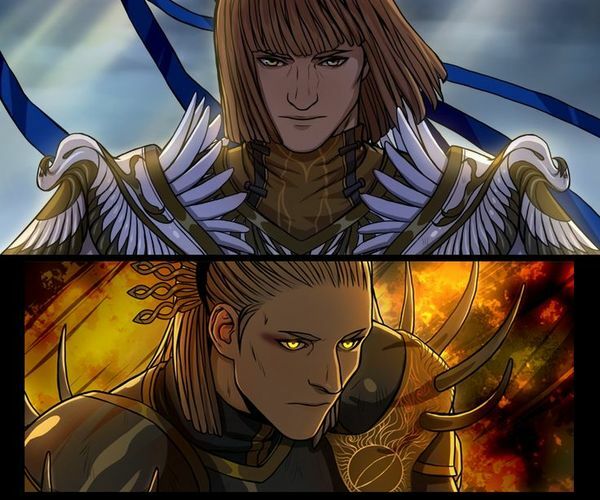 Only when the destiny of Arda is to be finally determined by Ilúvatar itself shall the Dark Lord return again for the final clash of all; but the future of the World is not precisely known even by the very Valar, and the holy Manwë and Varda, should have they seen something of what is to be of Eru's Plan, have never revealed it. The relentless malice that had poisoned the World for millennia was then gone forever, but, as tales often and sadly remind us, the wounds that it had caused were too thorough to be healed completely. Some servants of the Enemy found too refuge from destruction and fled throughout Middle Earth, longing for the proper time to spread terror again. Sauron, the lieutenant of the Dark Lord, surrendered to the Host of the West and knelt in front of Eönwë's magnitude, asking for forgiveness and piety. The Herald of Manwë did not have, though, the authority to grant something of that kind to whom had been such a fierce opponent to deal with and guilty of many sorrows and deaths among the Free People. Sauron was thus invited to sail back to Valinor to be judged by the whole council of the Valar and be sentenced for his atrocities. He was thus greatly afraid of punishment, still consumed by hatred and his obscure desire of dominion was burning him inside. Sauron eventually decided to flee and concealed himself in the wild and unknown East of Arda. His plans and schemes will be fundamentally decisive for the World's future and they shall shape indeed the fortunes and misfortunes of Middle Earth, in events that have not yet come to pass in this narration. The inhabitants of Beleriand and all Middle Earth found a very different and profoundly changed World, at the end of what had been the greatest and hardest war in the whole lore of Arda. As it has already been narrated in the previous chapters of this tale, the clash between the Archangels and the Evil in the North had shattered the foundations of Middle Earth from its deepest roots. Mountain chains were brutally levelled and rivers disrupted. The physical wounds of this mythical conflict were in fact too severe to avoid the inevitable fate that the western shores of the World would have faced soon after. At last, thus, the poisoned and marred Beleriand sank in the Sea, dragging all those legendary lands that are mentioned with joy or fear in tales into the waters of Belegaer, and forever shall they be lost under its surface. The Blue Mountains, some western traits of coast and very few other territories survived the catastrophe, but they lost almost all of their own past splendour and beauty. The majority of the green and fertile Beleriand was eventually erased by the Wrath of the Powers of the West, and never had a cost been so great for Arda until that moment; but, sadly, the Eldar and the Edain were yet to discover how cruel and more furious the just judgement of the Valar could still be. What happened later, though, belongs to the following Age and its relative tales. Before the actual sinking of Beleriand, the Host of Valinor and the Free People that helped it managed to return to the West or decided to move to the East. 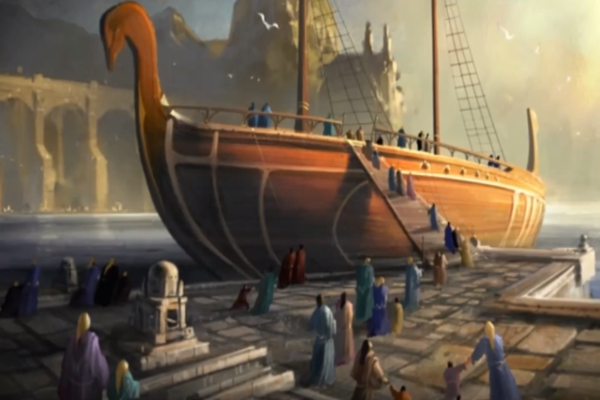 In those chaotic days, the western shores of Middle Earth were full of dockyards and arsenals in full activity, and many new ships were made to transport the Elven survivors of the War of the Jewels beyond the Sea. 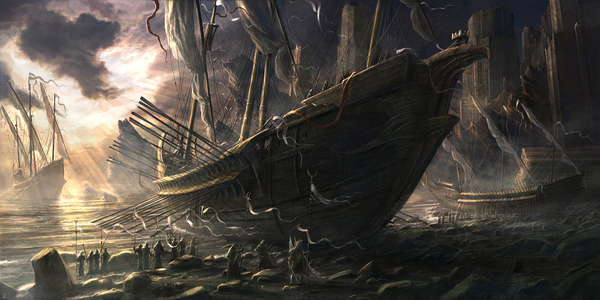 The Valar, in fact, recommended all the Eldar that still lingered in the mortal World sail back to Aman, in order to find peace and a shelter that could have never been tainted by the Evil (many were the remnants of Shadow and Darkness that persisted in Arda, and safety was thus not guaranteed out of the holy borders of the Immortal Shores). The majority of the sorrowful Eldar accepted the advice, and, along with the Maiar, the Vanyar and the Noldor of Aman, eventually journeyed through Belegaer and departed from the sad lands of Middle Earth, never to return. The Valar lifted their Ban and forgave all of those who had chosen the Exile; the exiled Eldar landed on Tol Eressëa and they were readmitted again in Valinor with joy and jubilee. 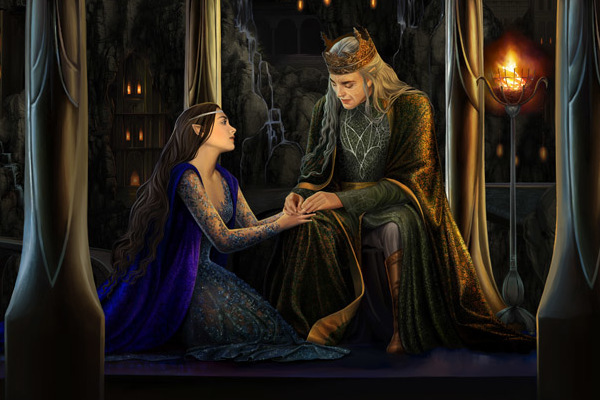 Despite the numerous partings, Gil Galad, the last High King of the Noldor, and his lieutenant Elrond decided to remain, moved by their love for the mortal World, and established the Elven kingdom of Lindon; Galadriel, the last living of her royal kin, and Celeborn had already departed from Beleriand before the final war and headed to the East as well, destined to rule over Sindarin realms. The Three Houses of the Edain that fought alongside the Good had suffered many losses due to the war's terrible and widespread destruction. The Valar rewarded their incredible courage with a new and safe land, in which the faithful Humans could have found refuge, away from the perils and uncertainty of Middle Earth. So, at Manwë's disposition, a prosperous five-pointed Island came out from the blue depths of Belegaer, located between the Undying Lands and Middle Earth (but closer to Valinor), at the centre of the Sea. 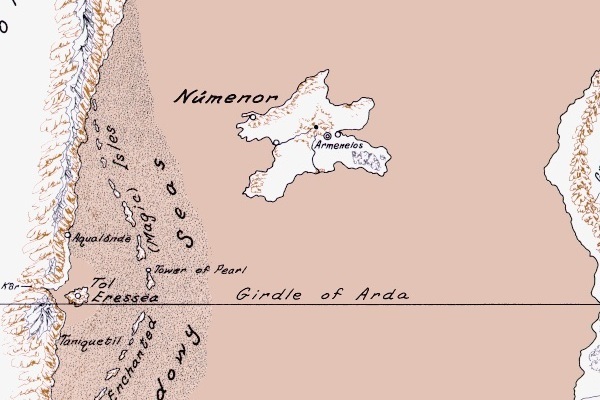 Elenna was called, the Land of Gift granted to the Edain by the Powers of Arda; in the years ahead, it will be commonly known and worshipped as Númenórë, and the homonym mighty realm was then established there. 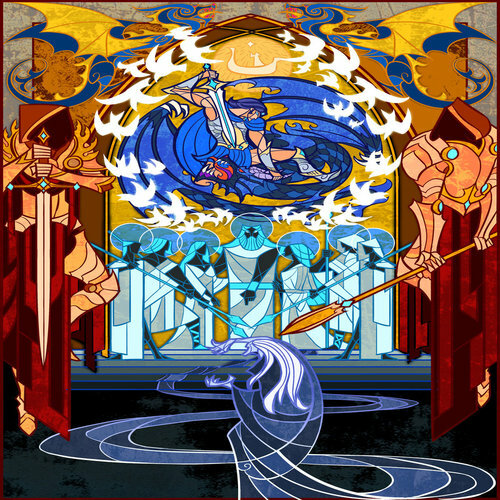 Elros, after his choice of embracing the mortal fate, led his people to their new home, under the guidance of his father's Star (Eärendil's Silmaril), and he became the first Númenórean King. His legendary dynasty would have rooted there for more than a millennium, intertwined with the very destiny of Middle Earth itself. 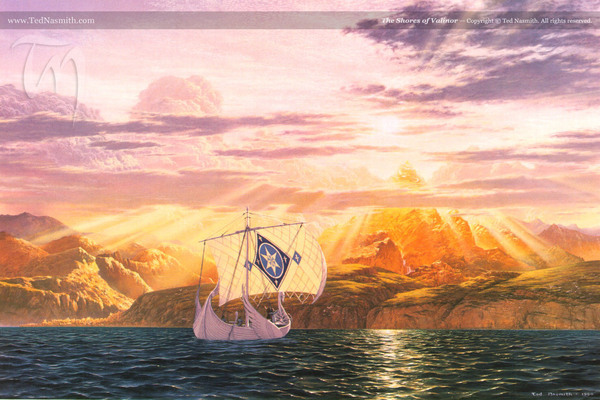 The merry days of the Númenóreans thus began, for they were the only ones of the Mortals to have had the privilege to leave so closely to Valinor, symbolising the eternal bond of allegiance and friendship between the West and the Faithful. The First Age ended. The Elder Days of Middle Earth had their bitter epilogue with the destruction of Beleriand. The remembrance of what had been remained alive only in the immortal memories of the mightiest High Elves, and much of once was got lost as the World progressively became disenchanted and grey. Unfortunately, this epilogue was made even more bitter by the theft of the two Silmarils that were rescued by Eönwë. Maedhros and Maglor were in fact consumed by their infamous and cruel Oath, and even in victory they eventually dared to steal the two hallowed Jewels that regarded as theirs. Their very endless desire led both of them to death. 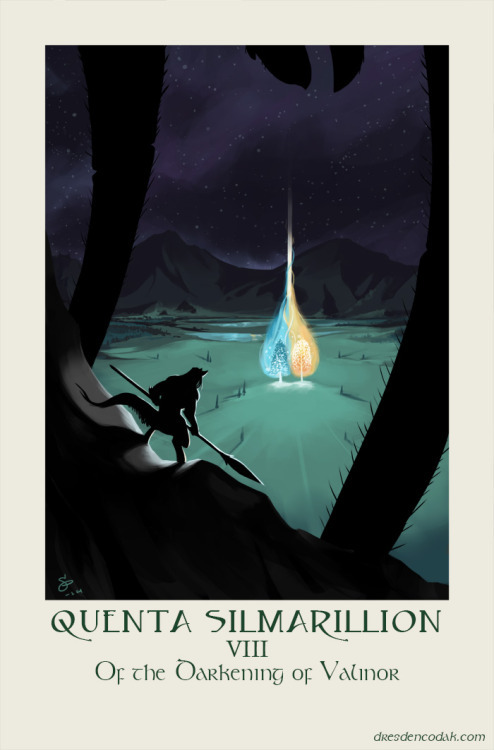 The Silmarils, at the end of these events, were claimed back by the very Elements of Arda: the fires of the Earth, the immense width of the Sea and the eternal Night and Stars in the Sky (upon Eärendil's Vingilótë). 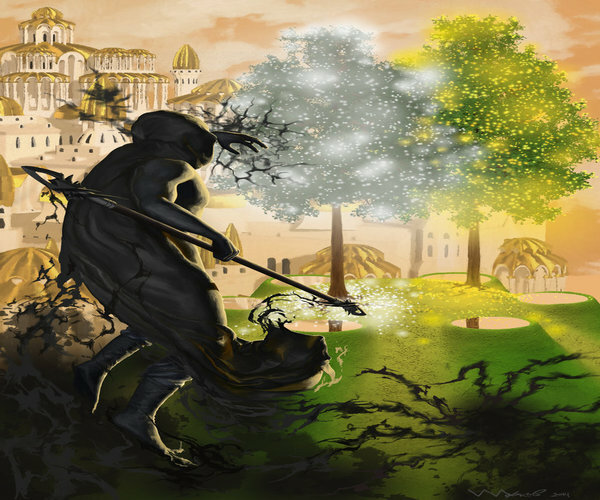 If, then, the three legendary Jewels, that keep alive the lost splendour of the Two Trees, are ever to be found again and used to revive the ancient Light that was before the Sun and the Moon, it will be not before Arda is broken and remade again by Ilúvatar itself, for not even the very Valar could ever have the power to rescue them without facing terrible consequences. 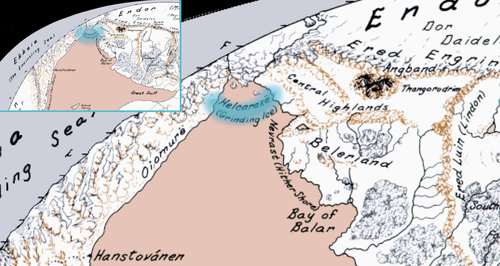 Beleriand was not the only land that sank into the water. The deadly Helcaraxë was erased too by that natural catastrophe, and the whole Aman would have thus been completely separated from Middle Earth until the End. The Archangels decided not to intervene anymore in the mortal World's affairs, for the sake of both Elves and Men, leaving the fundamental task of contesting the Evil to the undimmed spirit and determination of the Free People. Very heartful greetings to anyone who has constantly been interested in this topic so far and contributed meaningfully to this discussion with passion and cooperative spirit. After the War of Wrath update, I don't think I will publish other updates of that kind anytime soon; I would rather like to start now and then some holistic lore debates about Aman in general, both referring to specific events of Arda's mythology and also widening the perspective about fundamental basic themes of the Tolkien's Legendarium at the maximum. There often are some particular and apparently of little relevance elements in stories that do instead give so much material to speculate and imagine about. Especially in Tolkien's writings, whose renowned cryptic and tale-like wording can turn out to be quite as tough to manage as his very rich descriptions of events and characters. This one, from the Silmarillion, always catches my attention. Fëanor and his sons abode seldom in one place for long, but travelled far and wide upon the confines of Valinor, going even to the borders of the Dark and the cold shores of the Outer Sea, seeking the unknown. Often they were guests in the halls of Aulë; but Celegorm went rather to the house of Oromë, and there he got great knowledge of birds and beasts, and all their tongues he knew. For all living things that are or have been in the Kingdom of Arda, save only the fell and evil creatures of Melkor, lived then in the land of Aman; and there also were many other creatures that have not been seen upon Middle-earth, and perhaps never now shall be, since the fashion of the world was changed. The material we are offered is very interesting. After the fall of the primordial holy residence of the Valar in Almaren and after the great cataclysm brought upon by the destruction of the Two Lamps, it is very likely that most of the ancestral animals and plants that inhabited Arda were wiped out by such immense ruin. 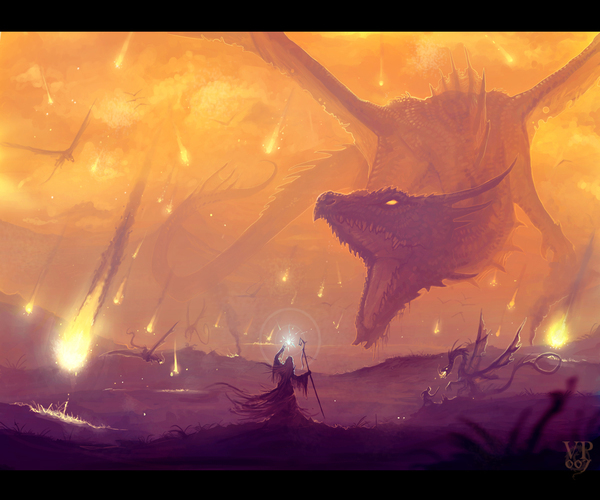 The Valar managed to rescue, though, much of the Light of Almaren and they may have saved some of those beasts too. Then, as we are told, in Valinor, the Archangels made a lot of new things under the blessing influence of their greatest masterpiece: the Two Trees. That eventually even surpassed the beauty of the lost Spring of Arda. It is therefore possible too that some other new animals and plants were created and hallowed within the Pelóri, so that they would have ever been destined to be absolutely unknown to the outer mortal lands. The frozen waste in which are located the two blue Sphinxes of Neverending Story reminds me very much of the frozen and deadly pass of Helcaraxë, that united Aman and Middle-earth before the War of Wrath and the end of the First Age. That ice-land is also immersed in total darkness, if not for the starry sky, and that could be easily relatable to the situation of all the lands out of the walls of Valinor, during the Years of the Trees. Only the Ainur are capable of journeying through it without suffering any toil or pain, while even the mightiest Eldar could find death in the march (as it exactly happened after the Noldor's exile). Personally, I really like the fact that, even in the continent of the Powers of Arda, there can be such hostile and dangerous places, not less ghoulish than Mordor, Minas Morgul or Moria; just to give some names: the black and long shores of Avathar in the south (once the lair of Ungoliant), the cold desert of Araman in the north and Helcaraxë. I reckon it means that there are no real safe places but the shores of Eldamar and, most importantly, what lies within the indestructible wall of the Pelóri: the Blessed Realm. 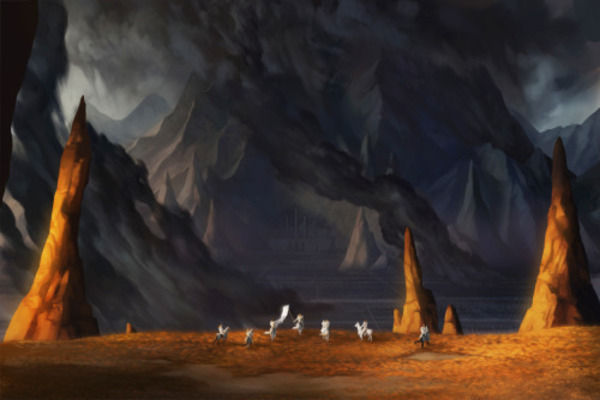 These deadly places might also be regarded as additional defences, to guard Aman even more from possible attacks from the East, back when the Valar had decided to wage direct war against Melkor. Other renditions of the Helcaraxë, the frozen waste which only the Ainur can get through unaltered and unspoiled. An interesting interpretation of the eerie region of Avathar in Aman, lair of Ungoliant until the Darkening of Valinor. 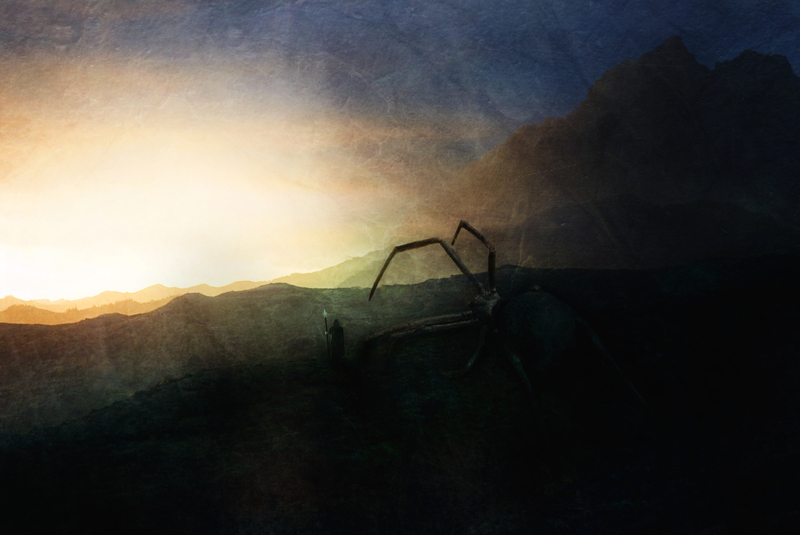 Actually, the picture seems to show Melkor and Ungoliant climbing the Pelóri and probably reaching the mountainous chain's peak. As it's shown, the two are contemplating the blessed lands of the Valar's realm lit by gold-like radiance and are particularly focused on the source of that holy light: the Two Trees. Speaking about Melkor and Ungoliant, I can introduce an additional element of Aman, which is probably not so commonly known in tales: Hyarmentir. Hyarmentir is one of the tallest peaks of the Pelóri (it seems to be the second tallest after Taniquetil) and is located in the south of Valinor, near the Woods of Oromë and the hallowed Pastures of Yavanna. It was this precise mountain, as it's shown in the picture of my previous comment, that Melkor and Ungoliant climbed to reach the beating heart of the Blessed Realm and then put an end to the Noon of Valinor. Particularly, Ungoliant wrought her dark/anti-light web between the clefts and pinnacles of the Pelóri and thus permitted the dark Vala to violate the sanctity of the Powers' domain. P.S. I'm resolved to deal soon with the dwellings of Mandos (Námo) and Nienna in the Blessed Realm. Two very particular places which don't comply exactly with the joyful atmosphere of the context they are immersed into. 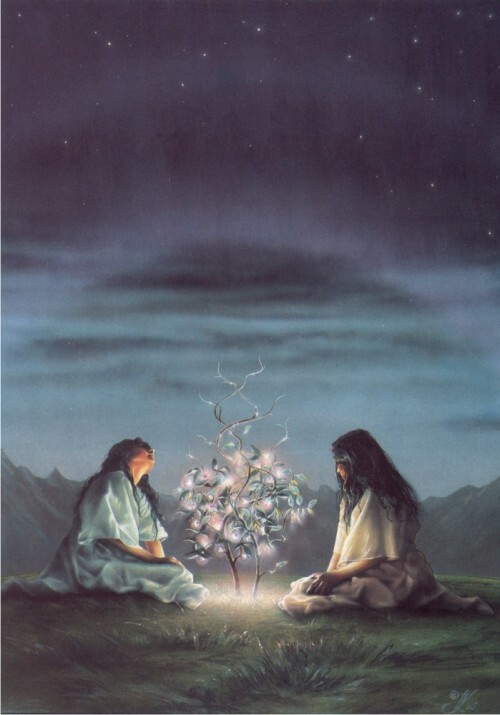 This image shows Yavanna and Nienna giving birth to the Two Trees of Valinor: the former starts singing and causes the growth of the Trees to finally have beginning, while the latter waters the two frail sprouts with her tears. Personally, I find it reasonable to think that even Varda was involved, ultimately giving those two creations the blessing of Light, of which she is the only source in Eä. So, under the star-lit sky of the end of the Years of the Lamps (approximately), the most splendid deed of the Valar enlightened their Blessed Realm for the first time, and so it would do for millennia later. I don't know where you keep finding these images but they are extremely impressive in quality. Although I not a big fan of Melkor with goat legs and a tail (what ? ) I really like the drawing style of that particular one, the way the two trees are fused together. I don't know where you keep finding these images but they are extremely impressive in quality. What I grasped so far by examining many different interpretations of the Two Trees is that there is really not a clear indication or measure of their actual appearance. I mean, Laurelin and Telperion are always referred to in very general terms, despite them being the greatest creation of the Valar. Although we are obviously aware of their true importance, the 'simplistic' myth-like wording of the Silmarillion uses often generic terms and the lack of details doesn't help either. Literally, set their holy properties aside, they are most of the times described as common trees would be. I in fact saw some versions represent them almost as random luminescent trees placed in the middle of a plain. I think this representation doesn't really give the right impression of what we're talking about. After a good deal of speculative activity (the exceptional nature they were endowed with, the vast lands under their radius, the fact that Ungoliant's presence was needed in order to take them down and what happens to her in the aftermath), I believe we can legitimately depict the Two Trees of Valinor as colossal wonders at the gates of the sacred Valimar, at the centre of the very plain of Valinor; worshipped by the Ainur and the Eldar equally. I admit I personally like monumental and majestic things, but in my opinion this is how the Two Trees are supposed to be, apart from everyone's different tastes. Unfortunately, I have not found yet a version that fully satisfies me, even though one pretty much nailed how I would envisage them.